Designing viable and integrative production systems is challenging for big companies. Researchers often fail to holistically consider the production system. Thus, the aim of this paper is to propose a holistic approach how the supply chain, the production and shop floor planning intermesh. Hereby a Viable System Model was applied. Standardized communication channels were able to be defined among three entities. In conclusion this newly proposed approach enables companies to reduce necessary stocks, production lead times and manpower allocation. This proposed approach boosts the efficiency of all production planning processes. This in turn translates to decreased stocks, shorter lead times and to more efficient manpower allocation. This holistic approach is a key to success for companies, in particular, in high-wage countries. The presented research is result of the Cluster of Excellence (CoE) on “Integrative Production Technology for High-Wage Countries” funded by Deutsche Forschungsgemeinschaft (DFG). Within the CoE “Integrative Production Technology for High-Wage Countries” several institutes at RWTH Aachen University are conducting research on fundamentals of a sustainable production strategy. 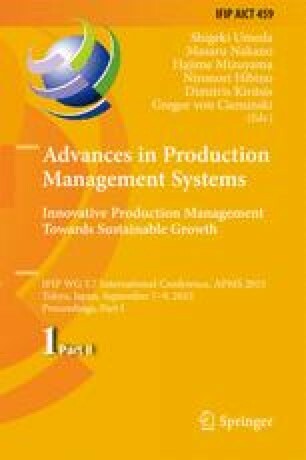 The authors would like to thank the German Research Foundation DFG for the kind support within the Cluster of Excellence “Integrative Production Technology for High-Wage Countries”.